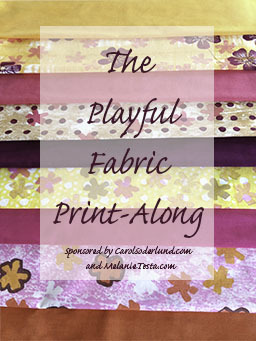 Melly and I are excited to announce our first online Playful Fabric Print-Along! It will be a month long event, throughout the month of April. First off, consider this your invitation to join our Playful Fabric Printing Community page on Facebook. This is a growing group of ‘playful friends’ who are working with our techniques and contributing to great discussion. We share photos, tips, video content and friendship in this fabulous and supportive community. Request to join and you will be accepted very quickly. Anyone can join, whether you participate in the Playful Fabric Print-Along or not. This is the place we’ll have discussions during the Print-Along and this is where participants share results. Participation in this Print-Along requires the purchase of and use of the Playful Fabric Printing book. Print-Alongs are participatory events. We will not be teaching you how to print, so much as printing by your side. We will answer questions in the community group, of course, but we will refer you back to the book when necessary. Also, Melly and I will be blogging throughout the Print-Along covering dye and print related matters. Each of you will make tools of your own or use favorite tools to create between 1-9 prints. It may be that you print one gorgeous print or you might choose to “speed print” multiples (Playful Fabric Printing, page 90). On April 28 we will have a ‘Show and Share Roundup’ in the Playful Fabric Printing Community page. Bloggers in the community who choose to blog about their participation, will be featured on our Playful Fabric Printing Pinterest Boards. Here is my Playful Fabric Printing Pinterest board, and here is Melly’s, so please share your posts with us–AND use our hashtag #playfulfabricprinting! To join in the fun, just let us know you are joining the Playful Fabric Print-Along inside the FB community page. During the Playful Fabric Print-Along our good friends from PRO Chemical & Dye and StencilGirl and of course, MellyMarksPlayfully are offering coupons to members of our Playful Fabric Printing Facebook Community. Come collect your coupons! Thanks to PRO Chem, StencilGirl, and Melly Marks for making this event even more fun! Playful Fabric Printing Blog Hop Roundup! I don’t know if I will be able to participate, but will definitely follow along! We are in the middle of maple syrup season and about to start up the greenhouse. So happy to see you all doing this…Most inspiring!! Looking forward to seeing you in the FB community, Charlotte! So sorry to be joining late but it’s better than never. Sorry to be joining late but it’s better than never. Hi Glenda, I can sell you one. Email me at carol (at) carolsoderlund.com and we can make arrangements. Thanks!